FOSJOAS intelligent self-balancing scooters U3 is the latest model subsequent to the two-wheeled intelligent scooter FOSJOAS V9. FOSJOAS V9 came as the prelude to the age of the two-wheeled intelligent scooter. Since FOSJOAS V9 won the support and likes of numerous customers and scooter-lovers, Moben Global Inc. rolled out another upgraded two-wheeled scooter FOSJOAS U3. U3 has its own features different its predecessor. 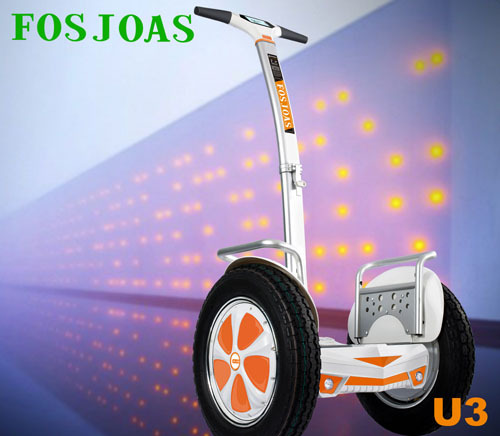 By and large, the design of FOSJOAS U3 is more considerate compared with FOSJOAS electric scooter V9. The first considerate design is its foldable shaft. The precious models like V3, V6 and V8 boasted their portability and convenience. They can be took onto the bus and the metro. However, the new model FOSJOAS V9 unfortunately lost that feature. Therefore, the store of FOSJOAS V9 needs a large room. It is absolutely hard to put it into the boot and smoothly close the boot. In view of this, FOSJOAS U3 is equipped with the foldable shaft. When it is need to be folded, the owner could fold the shaft and store it. The store of FOSJOAS U3 takes a little room. It even can be put into the boot without a hitch. The considerate design claimed a host of favourable comments. Another thoughtful design is its wing. Unlike FOSJOAS V9, FOSJOAS intelligent self-balancing scooter U3 is outfitted with a wing on its front. FOSJOAS U3 is positioned as a personal all-terrain vehicle (ATV). Being an ATV, FOSJOAS U3 is obliged to pass some tough terrains like other ATVs. When FOSJOAS U3 passes the muddy path, it is subject to be stained with the muddy water. In order to shield FOSJOAS U3 from mud and keep it clean, the R & D of Moben Global Inc. installed a wing on FOSJOAS U3 two wheel scooter, which effectively prevents the muddy water from splashing over it. All these considerate designs aim to bring a comfortable ride to the rider. Next：How to Ride a Fosjoas Self-balancing Electric Unicycle?